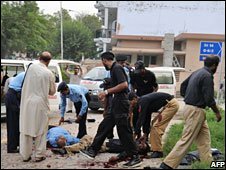 Although the bombings in Islamabad and Karachi may not be directly connected, the fact that they occurred just a day apart further signifies the country’s degenerating security situation. Although there are many militant groups that espouse different ideologies and rhetoric in Pakistan, it is often in their common interest to perpetrate acts of violence that further destabilize the current security environment. As a result of such attacks, tensions and anti-government sentiment are often exacerbated, which is ultimately detrimental for the country’s current state of affairs. Although the Pakistani government has indicated their commitment to countering such forces, their responses to such attacks must be stronger and far more united. Rather than just releasing generic condemnations, responses from all members of the ruling coalition (PPP, PML-N, ANP, etc.) should continue to vilify these groups so that blame is shifted towards those conducting the attacks, rather than just those in power. im surprised on the lack of BBC coverage on the series of bombs in karachi… either i have done a bad job of looking for the article, or this “wordly” website has no clue of the events in karachi. I understand the anger, grief and sense of helplessness when there are bombs going off so frequently, however, what’s the point of rioting against the current government after voting them in less than six months ago? Have we had enough of the coalition already? Is it time for fresh elections? What will this accomplish and who do we want to see in power? Does burning tires and creating additional havoc on the streets resolve the problem?